The Story: A high-strung ballet dancer (Natalie Portman) gets the role of a lifetime, the lead in Swan Lake, on one condition: she still has to convince her abusive director that she can play the darkly sexual black swan as well as the delicately asexual white swan. Having already pushed herself beyond human endurance to get to this position, she inevitably snaps under the newfound pressure and begins to lose sight of the line between reality and madness. 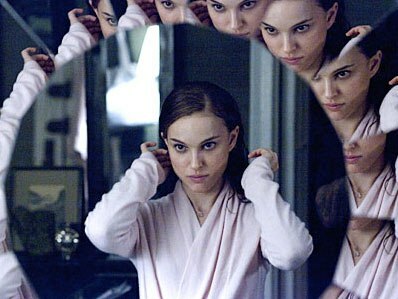 Does her newfound rival within the company (Mila Kunis) actually exist or is she just Portman’s imaginary dark doppelganger --or is she a little bit of both? Why This One: I don’t have to be so defensive about this one, since it’s been widely acclaimed. It’s got a genius performance by Portman that’s sure to win an Oscar and it also catapults Kunis into the ranks of serious actresses. Aronofsky sees this as a direct follow-up to The Wrestler, one of the best films of last year, and he finds several sly parallels between the two worlds, even though one setting is the snootiest of the high brow, and the other is the lowliest of the low brow: in both cases, the performers are asked to brutalize their bodies beyond reason but pretend that all they’re doing is putting on a show. In both cases, there is no good future for those that the profession has used up and spit out. And in both cases, the hero Aronofsky chooses is determined to leave the stage on their own terms, no matter what the consequences. Never Apologize: Early on, Portman accidentally insults a fellow dancer, prematurely congratulating her on getting the role that Portman has actually won for herself. It looks like she did it on purpose to rub it in, even though it’s just an honest mistake. But the movie doesn’t give Portman the chance to apologize. In fact, we never see the ousted dancer again. Apology scenes are death. They reverse the momentum. Maybe Portman’s character did apologize, offscreen, but onscreen the director has a job to do, and that requires him to constantly tighten the screws. Depth is Found in Holes: In fact, like Portman’s character, the viewer often has the unnerving feeling that we’re having black-outs. We’re never quite sure how the previous scene’s conflict got resolved or if it did. We’re being jerked forward through the story on a leash, without time to make sense of our surroundings. And we love it. Drama Is How It Is, Genre Is How It Feels, but if you’re really good, you can do both at the same time. So is this a straight drama, or a psychological thriller, or a supernatural horror movie, or what? Aronofsky pulls off the remarkable feat of being all things to all people. The viewer can easily choose to reject the supernatural element entirely, interpreting those elements as merely visualizations of what the experience feels like to Portman. But horror fans who accept what they see will also be satisfied. This is super-advanced filmmaking, since it allows us to disbelieve what we see and still get caught up in the story. Don’t try this at home! Only geniuses can pull this kind of stuff off. Sympathetic Doesn’t Have To Mean Likable: The standard Hollywood way of making this movie would be to start off with Portman as a sweet young girl whose life is gradually ruined by this horrible experience, but no, Aronofsky and Portman made the startling and daring choice to have her character be pretty far out to sea right from the beginning, already too far gone to save. This experience is merely the last chink that shatters an already fractured window. This isn’t a journey from A to Z, it’s a journey from Y to Z, and that’s why she’ll win the Oscar. Because she has less ground to cover, she’s able to take the time to break our hearts with every minutely observed detail of this final battle. She’s not an everywoman, she’s a specific woman, suffering through a crisis that is unique to her own psychology.